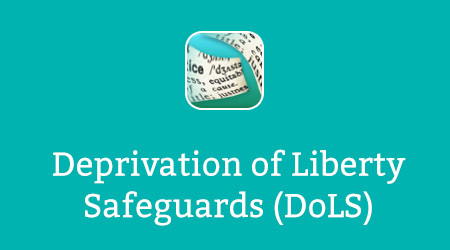 The Deprivation of Liberty Safeguards (DoLS) e-learning programme is now available for use by qualifying doctors. The e-learning programme has been extensively revised and updated and has been released as part of a collaboration between Health Education England, the Department of Health and the Royal College of Psychiatrists. The programme replaces any previous training on DoLS by Health Education England e-Learning for Healthcare. The supervisory body must be satisfied that the person has successfully completed the Deprivation of Liberty Safeguards Mental Health Assessors training programme made available by the Royal College of Psychiatrists. DoLS are an integral part of the Mental Capacity Act (MCA) and it is essential that doctors and mental health assessors have a good practical knowledge of the MCA. The MCA Test of Understanding has been created as part of the DoLS programme and all users must complete and successfully pass the test before moving on to the DoLS e-learning resource. Users will also need to complete and pass the DoLS Test of Understanding once they have completed the e-learning training programme. Only when a user has successfully completed and passed both the MCA and DoLS test will they be able to generate a certificate, which can be presented to a supervisory body as evidence that they have satisfactorily completed the DoLS online training programme. The role of the mental health assessor is an important statutory role. Once doctors have successfully completed and passed the training, they are eligible to play an essential part in a process designed to protect the rights of vulnerable people who lack capacity to make their own decisions about their accommodation for care or treatment. Depending on the outcome of assessments carried out by the mental health assessor, and also by the best interests assessor, a person’s deprivation of liberty may be authorised as being lawful and in their best interests. DoLS: Test of Understanding (753-018) which again a user must pass with a satisfactory score of 85% or more in order to attain the DoLS certificate. This can then be presented to a DoLS supervisory body as evidence of successful completion of the e-learning course. The writers of this new training programme have extensive practical and theoretical knowledge of DoLS; all teach and advise extensively on this area. They include an experienced psychiatrist and mental health assessor, a best interests assessor who is also an approved mental health professional and a lawyer specialising in the Mental Health Act (MHA) and the Mental Capacity Act (MCA). They have been further supported by a former DoLS lead who is a member of the leadership group of the new National Mental Capacity Forum. If you already have an account with e-LfH, then you can enrol on to the Deprivation of Liberty Safeguards programme by logging in to the e-LfH Hub, selecting My Account > Enrolment and selecting the programme. You can then access the programme immediately in the My e-Learning section. In the event that you do not qualify for free access to the Deprivation of Liberty Safeguards programme, you are able to license access through eIntegrity, a community-interest company established for this purpose. For more information on the licensing options available for the Deprivation of Liberty Safeguards programme, please visit the eIntegrity website. The Deprivation of Liberty Safeguards programme is also available to NHS healthcare staff via the Electronic Staff Record (ESR). Accessing this e-Learning via ESR means that your completions will transfer with you throughout your NHS career.